THE anti-drug campaign of the Zamboanga City Police Office (ZCPO) continue to gain headway as two persons were arrested while some P40,000 worth of suspected “shabu” seized in a drug bust in this city. 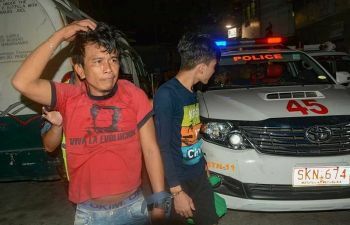 The ZCPO identified the suspects as Usman Yunos, and Dante Pawpiyan, a laborer, who were arrested around 6 p.m. Tuesday at Purok 2 in Sangali village. Seized from them were some P40,000 worth of suspected shabu (methamphetamine hydrochloride) packed in eight heat-sealed plastic sachets, P200 marked money, and illegal drug paraphernalia, the police added.